I was a Ph.D. student in the Image and Video Computing Group in the Department of Computer Science at Boston University. My advisor was Margrit Betke. My research focused on developing models of collective motion in order to understand group behavior using images and video. Following the completion of my degree in August 2015, I moved to my current role as a software engineer at Google, Cambridge MA. I graduated from Boston University in 2004 with a B.A. in Computer Science, where my advisor was Margrit Betke and I worked on counting and tracking bats in infrared thermal video. I received a Master's Degree in Media Arts and Sciences from the MIT Media Laboratory in 2006, where my advisor was Mike Bove and I was a member of the Object Based Media group. From 2006 - 2009 I was at BAE Systems in Burlington, MA, where I worked first in radar tracking in the Fusion Technology and Systems Division, and then in applied computer vision in the Signal Understanding and Networking Division. CS585 — Image and Video Computing. Spring 2014. Our class page on Piazza was: https://piazza.com/bu/spring2014/cs585/home. CS585 — Image and Video Computing (Margrit Betke). Fall 2012. Teaching Assistant. CS112 — Introduction to Computer Science II (John Byers). Spring 2011. Teaching Assistant. CS585 — Image and Video Computing (Margrit Betke). Spring 2010. Teaching Assistant. My research focused on developing models of collective motion in order to understand and analyzing group behavior using images and video. I used the evening emergences of Brazilian free-tailed bats (Tadarida brasiliensis) as a study system. The Brazilian free-tailed bat (Tadarida brasiliensis) lives in extremely large colonies in the southwestern United States. Some caves are known to contain millions of bats. In the evening, the bats emerge from their roosts in spectacular, highly structured columns, and maintain these formations for many miles. This unique behavior makes them an interesting target for study, as we try to understand the mechanisms that enable this phenomenon. 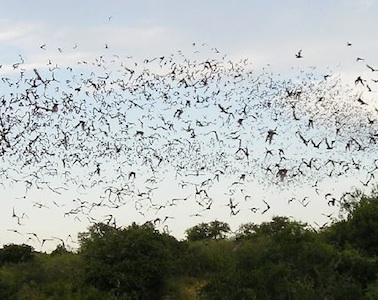 Current work focuses on developing models of collective behavior and understanding behavior of bats by using wide-baseline stereo and multi-target tracking to track the bats in 3D. In previous years, we developed successful techniques for segmenting and tracking bats in monocular infrared thermal video, used for censusing populations of Brazilian free-tailed bats at several caves. D. H. Theriault, N. W. Fuller, B. E. Jackson, E. Bluhm, D. Evangelista, Z. Wu, M. Betke, and T. L. Hedrick. "A protocol and calibration method for accurate multi-camera field videography." The Journal of Experimental Biology. 217:1843-1848, 2014. D. H. Theriault, M. Walker, J. Y. Wong, and M. Betke. "Cell morphology classification and clutter mitigation in phase-contrast microscopy images using machine learning." Machine Vision and Applications. July 2012. DOI: 10.1007/s00138-011-0345-9. D. Theriault, Z. Wu, N. Hristov, S. M. Swartz, K. S. Breuer, T. Kunz, M. Betke. 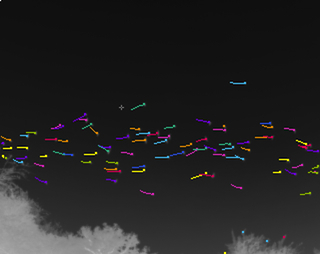 "Reconstruction and Analysis of 3D Trajectories of Brazilian free-tailed Bats in Flight", In the proceedings of the Workshop on Visual Observation and Analysis of Animal and Insect Behavior (VAIB) held in conjunction with the International Conference on Pattern Recognition (ICPR). 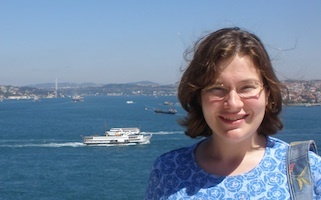 Istanbul, Turkey, August 2010. N. Hristov, M. Betke, A. Bagchi, D. Theriault, T. H. Kunz. "Seasonal variation in colony size of Brazilian free-tailed bats at Carlsbad Cavern using thermal imaging" Journal of Mammalogy. 91(1):183-192, February 2010. Abstract, pdf. M. Betke, D. E. Hirsh, N. C. Makris, G. F. McCracken, M. Procopio, N. I. Hristov, S. Tang, A. Bagchi, J. Reichard, J. Horn, S. Crampton, C. J. Cleveland, and T. H. Kunz. "Thermal Imaging Reveals Significantly Smaller Brazilian Free-tailed Bat Colonies than Previously Estimated." Journal of Mammalogy, 89(1):18-24, February 2008. Abstract, pdf. Also discussed in Nature, 452, Research Highlights, p. 507. D. E. Hirsh, M. Betke, S. Crampton, J. Horn, and T. H. Kunz, "Censusing Brazilian Free-tailed Bats Using Infrared Thermal Imaging and Computer Vision Methods," 33rd Annual North American Symposium on Bat Research, NASBR, Lincoln, Nebraska, October, 2003. Winner of Lubee Bat Conservancy Award for an outstanding oral presentation. Boston University Computer Science Department "Academic Achievement" Award, May 2004. CRA-W CREU 2003/2004 (Committee on the Status of Women in Computing Research Collaborative Research Experience for Undergraduates), Project title: "Detection, Segmentation, and Tracking Algorithms for Analysis of Thermal Video of Bats." Lubee Bat Conservancy Award for an outstanding presentation. NASBR, Lincoln, Nebraska, October, 2003. Boston University Engineering Examination Scholarship (2000-2004).